As brewers and especially sour/wild brewers we love to age/ferment in different kinds of wood vessels. There is something beautiful and romantic about walking by large oak foudres or seeing rows of stacked barrels each living and breathing new life into a beer. Each different but striving for the same thing: to make incredible beer. All this is wonderful and utopian…until it isn’t. One of my favorite things about what I do at Yazoo is sourcing and picking out new (well new to us) barrels with some sort of neat character. Looking for the next interesting or hard to find barrel can feel like an ISO/FT post on one of the many beer trading forums. With many breweries having some sort of barrel aging program it can be a challenge to find exciting barrels in the quantity you need. Some of our barrels hail from places like Portugal and Jamacia…which have to be shipped into the USA then trucked to us. So imagine (and I know some of you know this first hand) that sinking feeling when you are walking by your beautiful row of neatly stacked barrels and step into a puddle of beer…or you leak test this incredible barrel and its not just weeping water; its flowing out! Well this is an issue that pops up from time to time and in most cases can be fixed or at least patched up enough to save the batch. 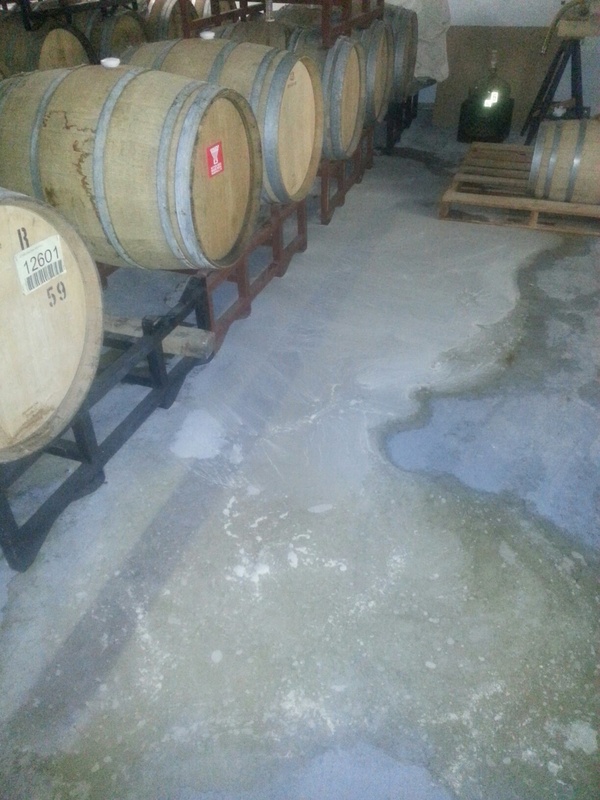 There are many different ways that brewers, distillers and vintners have created over time to help with a leaky barrel. There are solutions ranging from pre-made mixtures to ones created from ingredients in your kitchen cupboard to solid material fixes. I will preface this by saying some of these techniques I have personally or know brewers who I trust to have used and some are just ones I have heard of… I’ll also add these disclaimers, check your local/state health and food service laws (some places have really weird laws), consider possible allergens and these are not guaranteed to work. I’d like to open this up to discussion since this is not a complete list, however it is geared more to barrels that are leaking with beer inside them. Since more and more breweries/home brewers are using wood fermenting vessels I think we can come up with a great list of advice to help each other make the best beer possible. 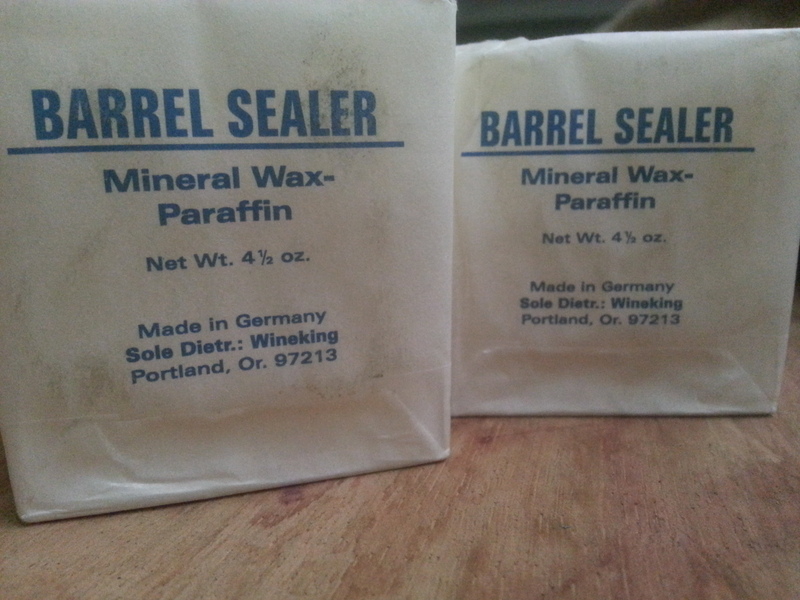 Barrel Sealant or Barrel Wax– Sold commercially. Most are Paraffin Wax based and can include Bees Wax or soft petroleum. They can be melted directly with a blowtorch to drip into the problem or in a pot then poured hot on the leak. Some can be hand “waxed” and worked into a leak using no heat. Prices can range from $1 an ounce on up to $3 an ounce. Sold by barrel brokers and some home brew shops. The picture to the right shows one the products I have used at Yazoo to fix a small leak. Good stuff for sure! 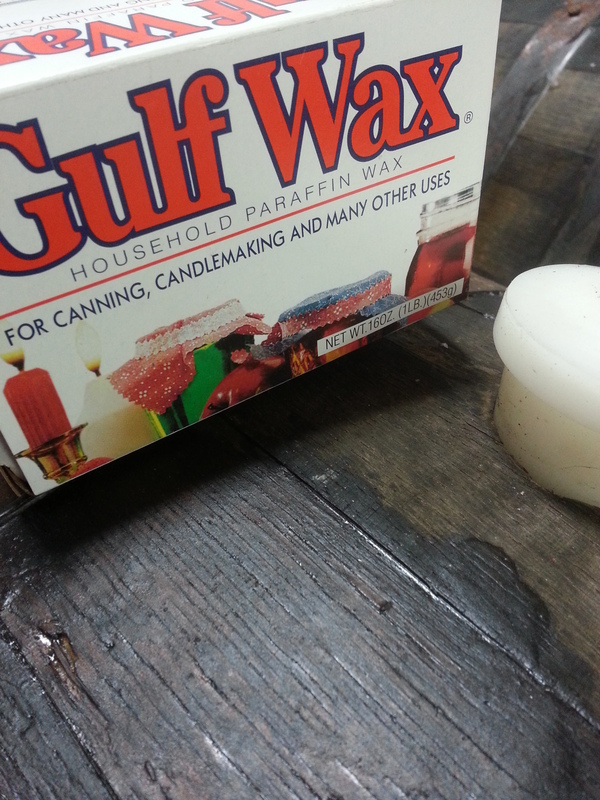 Paraffin Wax– Easily found in most grocery stores with the canning stuff or craft supply shops in the candle making area. The Gulf brand seems to be the most common. I paid about $2.30 for a 16oz box at our local grocery store. From my experiences and a few others I know, this needs to be melted. The 100% paraffin is too hard and flaky to work into most dripping areas. You can use this to fix a leak or to inexpensively wax seal the outside of a barrel. We recently acquired some 30 year old estate rum barrels from Appleton Rum in Jamaica. These barrels smelled absolutely incredible, but had some leaks when I swell tested them… well because they are over 30 years old and I should’ve filled them with beer sooner than I did. I didn’t want to strip the great character out of the barrel so I opted to wax the outside with Paraffin and use some of the Barrel Sealer in other parts. A combination of the 2 in different areas worked perfectly to fix all the issues. Also I didn’t want to take any chances so I did Paraffin the heads and croze of each barrel. An ounce a prevention is worth a pound of cure and more beer in your glass instead of the floor. (I made that last part up). Golf tees or Toothpicks- I’ve seen this fix mostly used around the croze or the chime of a barrel. Using the toothpick fix is pretty much pressing the end of the toothpick into the hole, it may require more than one. A word of caution, this can make the leaky hole larger too, but many have used it successfully. Spile or Golf Tee (unpainted/non treated)- File or whittle down the spile/tee and hammer tap it into the hole. Here is a great video and here is great reference sheet on this technique. DIY Pastes– These are pastes made to a consistency of really really thick oatmeal. The most common is a combo of unbleached flour and distilled water. Start with 1 cup of unbleached flour and begin slowly mixing in 1/4 cup of water until it is a thick moist paste (think drywall mud or joint compound). I do know of one brewer who has successfully used only flour to fix a leak. Some have used a small amount of blackboard chalk / Calcium Carbonate in the mix too. Chalk /Calcium Carbonate and garlic is another old school fix. Mixed to a very thick paste and dabbed on with your finger. Multiple application maybe necessary. I have never used either of this techniques, so hopefully someone who has can chime in with any additional information. Aquarium or Food Service Caulk/Sealant– Now this a touchy or tricky fix due to the fact of what is considered “food grade” by law and code in certain areas of the world. 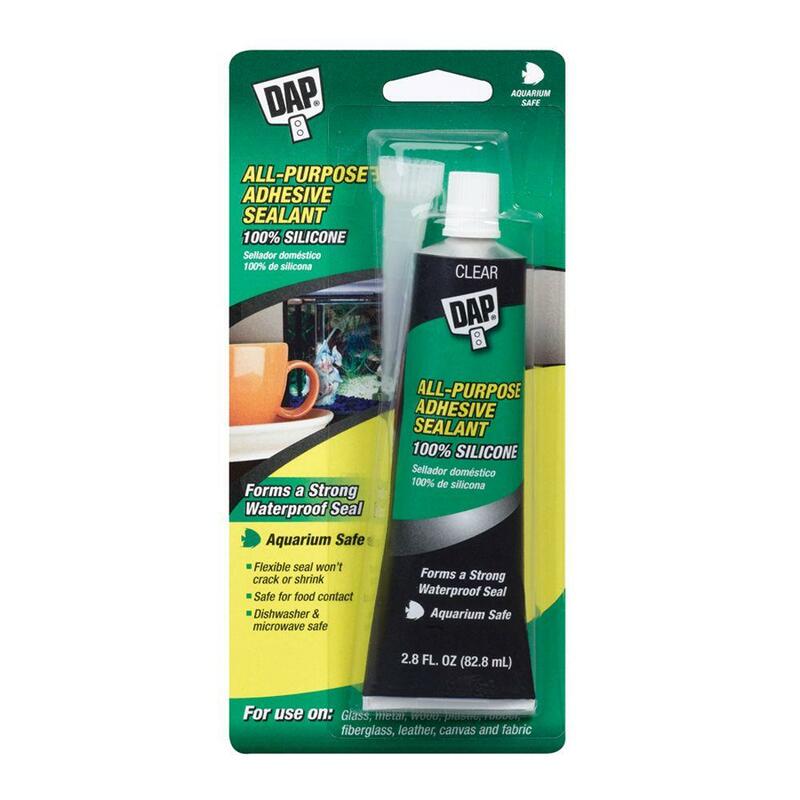 These are sealants made to obviously seal up aquariums. They are designed to not leach out any harmful chemicals into the water that could kill the fish or plant life. Some are listed as “food grade” water sealants and are used on walk in coolers, salad bars, dishwashers and ice makers. They are available in a number of places ranging from Home Depot to Amazon to Pet Stores in the form of squeeze tubes or sprays. The picture I am using is one example of many available, but they are always 100% silicone and usually clear in color. Force it!- Using a mallet or hammer to tap a leaky stave down or the hoop can work wonders. Others- (None of these I have used, only heard about) Pure beeswax or Petroleum Jelly, a hair drier/heat gun/torch to caramelize the sugars of leaking beer, paper towel or toilet paper pressed against a small weep.Comment and let me know how you’ve fixed a leaking barrel!Make sure you follow Embrace The Funk on Twitter and Facebook. First thing I do when buying my barrels is ask when they were emptied. I choose barrels that were emptied from their previous liquid within a week if wine, a month if spirits, at most. If it leaks, the first thing I would do is to soak the exterior in warm water for 12 hours on each side of the head of the barrel. I would then perform a leak test. If it still leaks I would repeat the water soak per each head. If barrel was designed to hold beer/ wine/ liquor, it will swell back to original holding capability. Once barrel holds fluid, you must steam the interior of the barrel to adequately sanitize knowing that even with proper steam sanitation it may prove a risky vessel for “clean” fermentation. Barrels are challenging. I love them but take great care when buying and never buy barrels that don’t seal well because they simply do not function as needed in brewing. If you want the challenge of restoring leaky barrels…it can be cumbersome and require multiple attempts to reseal. how do you steam the interiors? I have used the garlic/chalk method and it has worked rather well. Sometimes a very leaky barrel will require multiple applications. The paste needs to be thick and finger application is a great method. The paste dries pretty fast and forms a great seal. It is a very easy/cheap fix and I usually have it around the house.